In 2014, the United States Supreme Court handed down its decision in Alice Corporation Pty. Ltd. v. CLS Bank International, et al., 573 U.S. 208, which significantly altered the patentability of software, business methods, and e-commerce technologies (hereinafter referred to as “software”). This decision sent shockwaves through the industry, with some early commentators suggesting that Alice would be the death of software patents. While those initial claims proved to be hyperbolic, commentators were correct in their assessment that the case would make obtaining software patents significantly more challenging. Section 101 of the Patent Act confers patent eligibility on “any new and useful process, machine, manufacture, or composition of matter.” Over the years, courts have clarified that these four categories necessarily exclude laws of nature, natural phenomena, and abstract ideas from patent protection. However, the line between patentable and unpatentable subject matter in practice is not always clear. Software, for example, can often straddle the line between an unpatentable abstract idea and a patentable process because it involves the use of algorithms (unpatentable abstract ideas) in combination to produce a desired result (a patent-eligible process). If so, determine whether the claim’s elements, considered both individually and in combination, are sufficient to ensure that the patent in practice amounts to significantly more than a patent on the ineligible concept itself. The second step of this test (sometimes referred to as the “significantly more” factor or the “inventive step” factor) has proved to be notoriously difficult for lower courts and the United States Patent and Trademark Office (USPTO) to interpret due to its inherent subjectivity. Rather than providing a bright-line rule, the Alice test allows the person or court making the determination to exercise discretion when evaluating whether there is anything significantly more than the abstract idea in a particular claim. Due to this lack of clear guidance from the Court, the USPTO has operated with an abundance of caution when examining software patent applications, often issuing Alice rejections to any applications with claims that even remotely resemble software. One possible explanation for this zeal is that the USPTO is engaged in a delicate balancing act between two competing policy objectives. One is the need to eliminate overly broad software patents that nonpracticing entities often weaponize against small businesses with limited resources. The other is the need to ensure that legitimate software innovations remain patentable, as software is a critical component of our economy. Disagreement between examiners and applicants over the patentability of software claims often arises from the tension between these two objectives. Whatever the reasons behind the confusion, Alice has had a profound impact on software patent practice and significantly altered the software industry’s standing at the USPTO. Applicants and the attorneys who represent them have been forced to respond and adapt to this new reality in different ways, with varying degrees of success. In this study, we will examine Fish & Richardson’s software patent practice—how we were instrumental in developing the law underpinning Alice, how our attorneys handle Alice rejections, and what the future might hold for software patent practice. Alice did not come out of nowhere. The two-step test the Court applied in it was the culmination of a line of patent eligibility cases that began with Mayo Collaborative Services v. Prometheus Labs, Inc., 566 U.S. 66 (2012). Fish represented Mayo in that case and first developed the two-part test that the Court adopted in it for evaluating the patentability of claims directed to laws of nature. Fish advocated for the use of this test in Mayo because our goal was to establish a single standard—a “grand unifying approach”—that could apply to all patent eligibility determinations. In the years that followed, that goal was realized when the Court applied Fish’s two-step test to natural phenomena in Association for Molecular Pathology v. Myriad Genetics, 569 U.S. 576 (2013) and, finally, to abstract ideas in Alice. After Mayo, we sprang into action under the (correct) assumption that the Court would eventually extend its reasoning to patents directed to abstract ideas and that this could have potentially significant consequences for our software clients. Accordingly, our attorneys began drafting their applications with the Mayo factors in mind to circumvent as many future challenges as possible. To stay abreast of the latest post-Alice legal developments, we also launched the Fish Alice Tracker, the first case tracker of its kind to monitor subsequent district court, Federal Circuit, and Patent Trial and Appeal Board (PTAB) Alice decisions. By developing the legal standard that formed the basis of Alice, preemptively incorporating its reasoning into our software patent applications, and proactively documenting the lower courts’ application of it, we have always kept our clients one step ahead. Despite our early involvement in developing and implementing the Alice framework, our clients have not been immune from its effects at the USPTO. For many attorneys, a particularly challenging aspect of software patent practice is that the USPTO’s application of Alice is inconsistent from examiner to examiner and even from examiner to examiner within the same art unit. Practitioners find that some examiners will readily withdraw an Alice rejection if the applicant makes a well-reasoned response, while others will not withdraw an Alice rejection no matter what the applicant does. Although it has been over four years since Alice was decided, the consensus among frequent software patent applicants is that examiners are not much better at applying the decision consistently than they were when it was issued. This long-standing inconsistency may be explained at least partially by the nature of the Alice decision and Alice rejections themselves. Unlike other types of rejections, Alice rejections are rooted primarily in legal rather than technical reasoning. Because many examiners are not attorneys and have not been trained to make legal determinations, the jurisprudential aspect of Alice can often present a challenge for examiners when they believe they are required to issue a rejection based on it. While it is by no means the case that non-lawyers are incapable of making legal determinations, as a practical matter, many examiners are being asked to make determinations that are arguably outside the scope of their expertise. As a result, the line between patentable and unpatentable subject matter that Alice and its precursor cases intended to clarify is still blurry. Fish devotes significant time, resources, and talent to our software clients. Over a third of all Fish attorneys work with software-related matters in some capacity, and many had long and distinguished careers in the field before joining the firm. Further, most attorneys who practice software patent drafting and prosecution do so exclusively. The size and combined experience of this team allow our attorneys to share knowledge when testing strategies for handling Alice rejections, while the sheer number of software applications we have handled provides a solid data set for determining which of those strategies work and which don’t. This body of knowledge has allowed us unique insights into the inner workings of the USPTO and proved invaluable to our clients seeking software patents. Because this practice varies so greatly among examiners and art units, the foundation of a successful Alice strategy is to determine an examiner’s motivation for issuing the Alice rejection. After several years of experience, we have found that examiners generally tend to issue Alice rejections for two main reasons. The first is that the examiner (or his or her supervisor) believes that software is patent-ineligible subject matter and will ordinarily refuse to withdraw the rejection under virtually any circumstances. The second is that the examiner sees merit in the application but simply wants the applicant to clarify and strengthen the technical aspects of the claims. Our strategy will vary according to whether we believe that the Alice rejection is intractable or the examiner is amenable to eventually allowing the application. If the examiner’s insistence on the rejection appears unshakable, then there are very few options besides an appeal to the PTAB. However, for examiners who are friendlier toward software patents, the key to success lies in describing the software innovation in terms that have technical merit, and this is where Fish excels. We work with our clients to ensure that we understand their product inside and out and then draft our applications to maximize the likelihood that our examiners will consider the claims hard tech rather than pure software. By doing this, we might be able to avoid an Alice rejection entirely, and if not, we have prepared the application to have greater odds of withstanding the rejection and any possible ensuing PTAB appeals. 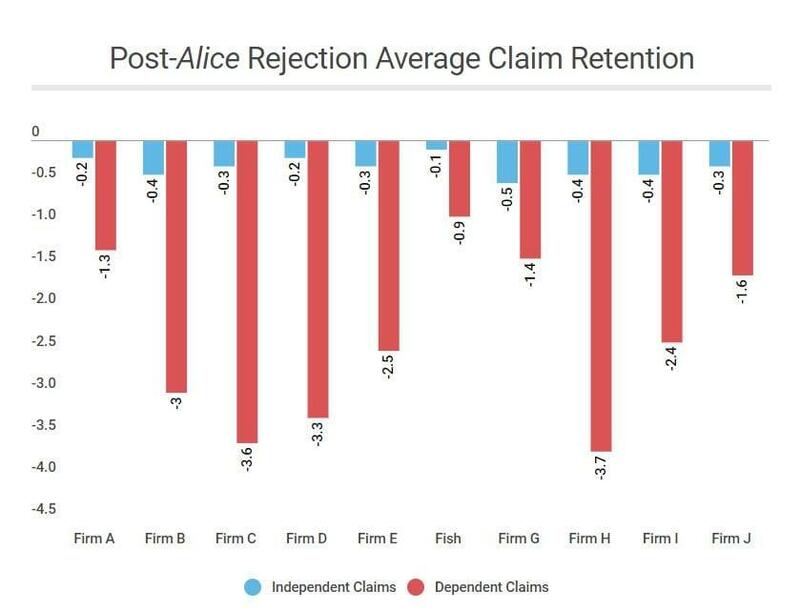 The lessons Fish has learned from our considerable experience handling Alice rejections have served our clients well, but ultimately the persistent questions surrounding software patent eligibility need to be settled. In the years since the Alice decision, the Federal Circuit has addressed these questions several times and provided additional guidance to lower courts and the USPTO. One particularly significant case was Berkheimer v. HP, Inc., 881 F.3d 1360 (Fed. Cir. 2018), in which the court held that patent-eligibility determinations often involve underlying questions of fact that when disputed make summary judgment an inappropriate remedy. In a move generally regarded as favoring patent applicants, the USPTO issued a memo to examiners inspired by Berkheimer that heightened the evidentiary requirements they must meet when rejecting claims under Alice. 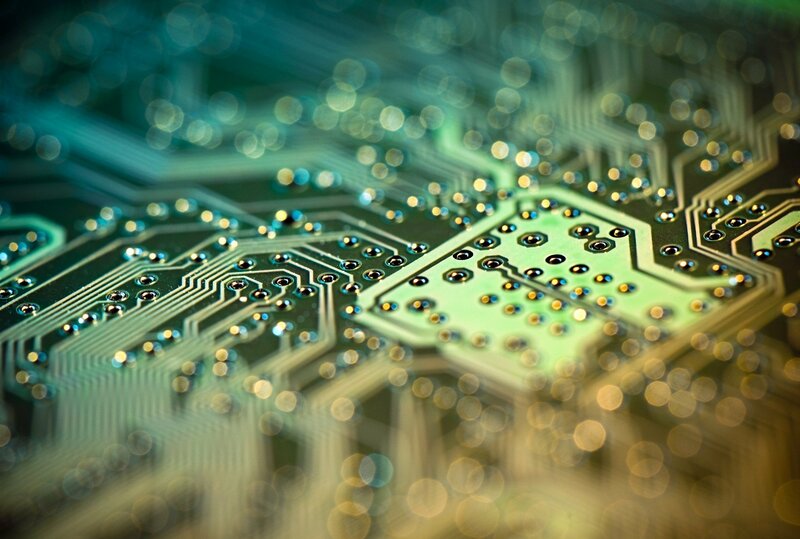 However, many Fish attorneys feel that Berkheimer and other Federal Circuit decisions do not go far enough toward providing additional safe harbors for legitimate software innovations. This opinion is rooted primarily in concern for the practical implications of software patentability. Today, the reasoning goes, the innovations that are changing the world most profoundly are not physical or mechanical devices but software, and this industry will constitute an ever-larger and more profitable sector of the economy in the coming years. As such, many of our clients and software patent attorneys are adamant that strong patent protection must remain available for software. Regardless of which side of the software patentability debate a particular attorney subscribes to, nearly all agree that software patent practice at the USPTO cannot go on under the present cloud of uncertainty forever. The prevailing theory among practitioners is that the most likely scenarios for change will be either a Supreme Court decision providing a clearer standard for determining patent eligibility or an amendment to the Patent Act that more explicitly defines patent-eligible subject matter. Who these changes will favor—and whether the USPTO examiner corps will implement them consistently—is another question entirely. The most direct route to obtaining a software patent in the post-Alice era is through an attorney who is tuned in to the pulse of the USPTO. Software patent applicants should thus seek an attorney who has handled many Alice rejections in front of a wide variety of examiners and is supported by a network of similarly practiced colleagues. The ideal software patent attorney should also be equipped with a deep technical background and expert drafting skills, ensuring that he or she will understand your technology and seamlessly translate it into patent claims that can withstand Alice. Fish brings together an elite team of attorneys who possess each of these characteristics and more, imbuing our software patent practice with the winning combination of legal knowledge, technical skill, and USPTO experience necessary to safeguard our clients’ most valuable assets. For more information about Fish & Richardson’s industry-leading software patent practice, contact your Fish attorney or email us at [email protected]. 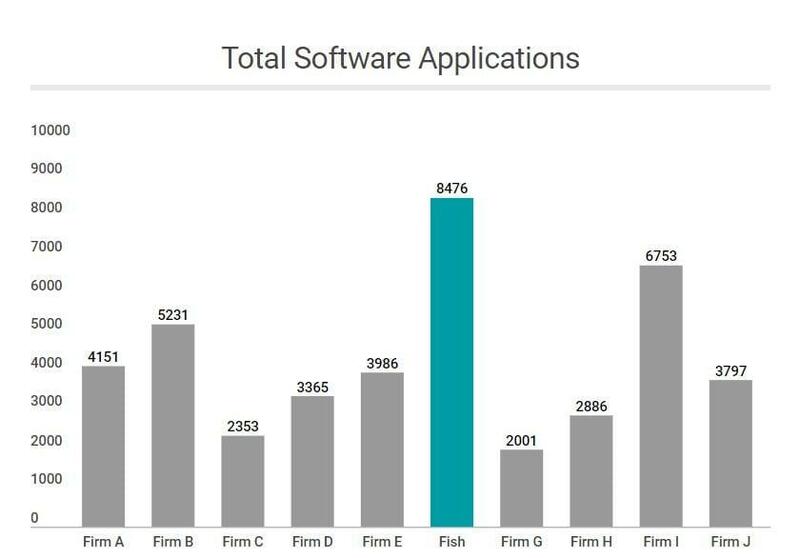 Fish’s success in software patent prosecution is supported by the data. 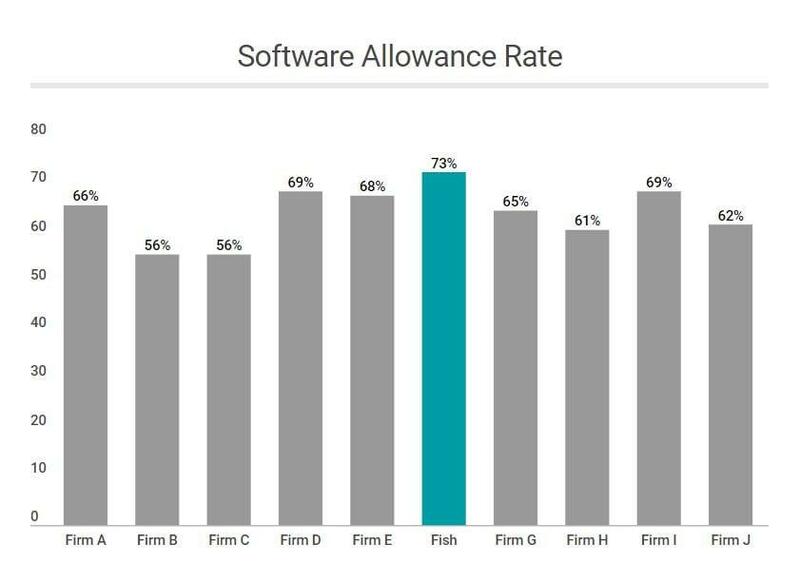 Not only have we handled more software patent applications than any of our peer firms, but our allowance rate is also higher, and we retain more claim scope after receiving Alice rejections. 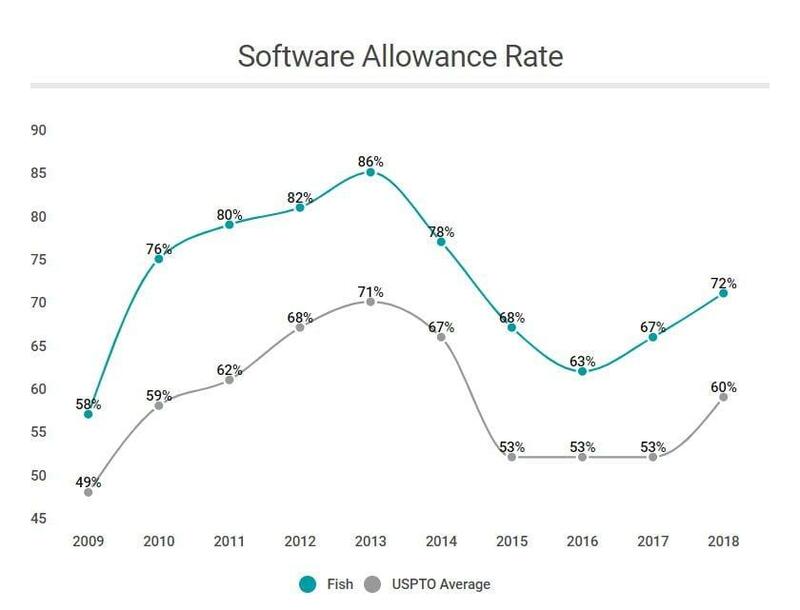 Our software patent allowance rate has also been significantly higher than the USPTO’s overall software patent allowance rate for many years. Please see the graphs throughout for Fish’s comparative software patent prosecution metrics. Fish’s “peer firms” are defined as the top 10 firms by number of patents received in 2017 (IPWatchdog). Prosecution metrics are based on patent applications filed in the software, e-commerce, and business methods art units of Technology Centers 2400 and 3600 during the years 2000-2018 and were compiled using Juristat data.